Dan slices the potatoes thinly using the slot on the side of our box grater. You want the potato slices to be about 1/4 inch thick. A mandoline makes them too paper thin, but the box grater works just great. Dan then soaks the potato slices in cold water, both to keep them from oxidizing brown and to wash off some of the starch. Then he drains and pats the potato slices dry when the other ingredients are chopped, and the pizza crust has gone through the first baking stage and is ready to receive its bountiful toppings. Arrange potato slices on pizza crust so that they are slightly overlapping at the edges. Sprinkle with chopped garlic, season with salt and pepper and brush on a little olive oil over all. Sprinkle with a final coating of Parmesan and then bake your pizza in a preheated 375 degree F oven for 15-20 minutes. 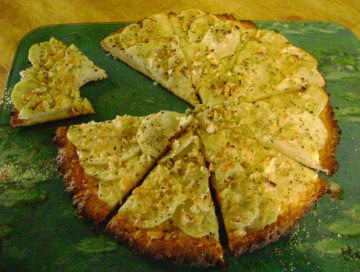 We saw a potato pizza being made on one of Martha Stewart's shows last year and experimented with the basic idea a few times before coming up with this version. You'd think having two starches in one recipe would be too heavy, but it's actually a nice combination and not too rich. It's been four years (and 400 posts!) of living gluten-free and Dan has finally perfected his pizza crust. He's the head baker in the house (I just dabble at it) and loves to tinker around with recipes for gf rolls and breads. After many, many tweaks and taste testings, the recipe below gives the latest, greatest version of a chewy, thin pizza crust, just like Dan used to chomp on in his carefree, pre-celiac days. Since we love pizza so much and since we are eating gourmet GF meals at home rather than dining out 99% of the time, we invested in a wooden pizza paddle, a pizza stone and special pizza pans. The pizza stone really seems to get the pizza crust to crisp up over our pizza experiments just using the pizza pans alone or trying pizza on a cookie sheet. Dan starts out with 2 cups of the flour mixture called for by the late GF legend, Bette Hagman, in her wonderful bread bible, "The Gluten-Free Gourmet Bakes Bread" (NY: Henry Holt, 2000). He makes this up in 12 cup batches and we keep this is a separate canister in the pantry so we can make up rolls, bread and pizza crusts more quickly at dinnertime. Dan adds potato flour for a springier texture in his pizza crusts. This recipe makes one pizza crust (about 12 inch diameter), though Dan usually makes two at a time and then pops one in the freezer for later. They thaw beautifully. Combine dry ingredients. Combine wet ingredients separately. Slowly add wet ingredients into the dry ingredients until thoroughly combined into a soft dough. Generously grease 16 inch pizza pan with shortening. Slap on dough and pat it into shape with a fork. Finish spreading dough to the edges of the pan with your greased hands. Bake pizza crust at 375 degrees F. for about 15 minutes, or until it is no longer wet on the bottom. Dust pizza paddle with cornmeal and slide pizza crust off the pizza pan onto the paddle. Place pizza stone in oven on a lower rack. Turn up oven heat to 475 degrees F. Add your pizza toppings (a marinara sauce well-seasoned with oregano and garlic and topped with shredded mozzarella is our usual go-to topping, but the aforementioned potato pizza with very thin slices of potato, chunks of garlic and rosemary is a close second. 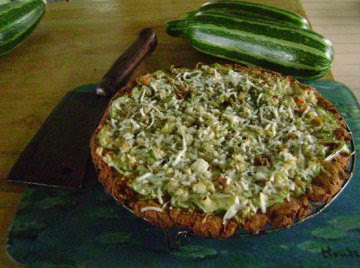 And when the zucchinis are flying out of the garden faster than we can harvest them, zucchini pizza (see below) rules!). Place pizza onto pizza stone. Cook until cheese melts and crust reaches desired crispiness, about 8-10 minutes. Keep an eye on your oven, though, as this high temperature can easily scorch all your hard work if you overcook it. Makes one 12 inch pizza. My real life has seriously been interfering with my virtual life hence the dearth of blog posts lately. I took over a volunteer position at my daughters' school and that, plus the book biz and various other projects have kept me from enjoying my cyber life as the Crispy Cook. However, one must still eat, so I have some recipes and cooking tips to share in some blog posts in the coming days. In the interim, here is a fresh cookbook giveaway and some announcements. Last month I offered a copy of the retro Peter Pauper Press book ""The ABC of Gourmet Cookery". The winner, picked randomly from the comments left after the November Cookbook Giveaway post, is Ellie. Congratulations Ellie! 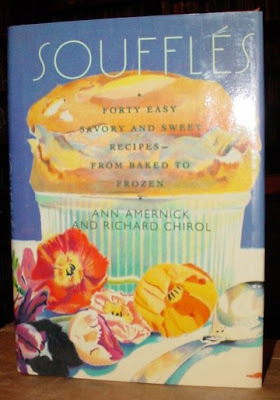 The cookbook featured in this month's cookbook giveaway is "Souffles: Forty Easy Savory and Sweet Recipes" by Ann Amernick and Richard Chirol (NY: Crown, 1989). Who doesn't love a souffle? And I'm sure we all could use a few new tricks to whip one up. This gently used book hails from Old Saratoga Books, the used and rare bookstore that my husband and I own and I would be happy to mail a copy to one of my Crispy Cook readers anywhere in the world. To enter the giveaway, just leave a comment below and I will randomly pick a winner after the deadline of December 31, 2009, midnight Eastern Standard Time. Good luck to everyone! I am also happy to announce a winner for the giveaway of some Betty Crocker fruit snacks and toys as described in this Crispy Cook blog post. The winner of this prize pack is Karin! Congratulations Karin! I hope all my American readers enjoyed a lovely Thanksgiving holiday. We had a nice feast and a relaxing day off. I basically reprised last year's Thanksgiving menu, minus several dishes because I simply didn't have a lot of preparation and cooking time this time around. I thought I was doing well with my organization, though, and had made a delicious sweet potato pie the day before, which I cooled and then covered with plastic wrap and stuck in my oven overnight to protect it from my dog Martha (she's a big girl and able to reach most surfaces in the kitchen). I also popped in some sticks of butter to keep soft for other baking projects the next day). 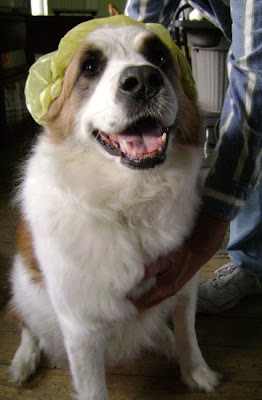 Here's a photo of Martha in her hygienic hair net helping out in the kitchen. On Thanksgiving morning I woke up early and with the help of my two daughters, started a highly smooth and organized feast prep with lots of appetizers made, gravies, stuffings and broths underway, and a gluten-free crust whipped up for my pumpkin pies. I preheated the oven to 425 so I could slip in my pies, and completely forgot about the stuff inside until toxic plastic fumes and burning melted butter set off the smoke alarm. What a mess! We had to open the windows, find the dog and cats amidst the acrid fumes and barricade them, and clean the oven before I could dare attempt to start roasting a 15 lb. turkey. Needless to say, we ate much, much later than planned and added another "crazy mom" story to the family folklore. I also want to let people know that I am the current host of Cook the Books, the foodie book club started by me and two food blogger friends, Deb of Kahakai Kitchen and Jo of Food Junkie, Not Junk Food. Our current book selection is Anik See's book "A Taste for Adventure: A Culinary Odyssey Around the World". See traveled by bicycle through Malaysia, Singapore, Patagonia, Thailand, Georgia, Turkey, Armenia, Indonesia, Argentina, Iran, Mexico and Canada, and her observations about this intimate tour of these lands and the people she met in transit is absorbing reading. To join us at Cook the Books, all you have to do is read the book, blog about it and something you cook up that is inspired by your reading. The deadline for doing so is Friday, January 22, 2010. I will post a roundup of blog posts and then the author herself, Anik See, will be our guest judge to pick a winning post. The winner receives a badge for their blog, addition to the Cook the Books blog roll and all the accolades one can put up with. Sound fun? Please do join us, we love reading everyone's thoughts about our book picks and seeing the creative entries from kitchens around the world.